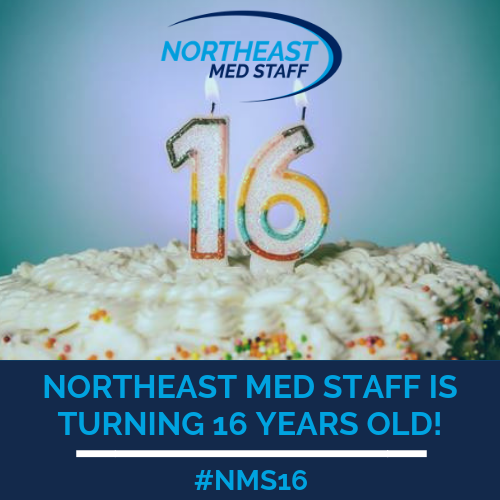 Northeast Med Staff is Turning Sixteen Years Old! We are celebrating sixteen years of connecting healthcare professionals with flexible job opportunities! We started as a small family owned company called, “Premier Medical Staffing,” serving the Massachusetts and New Hampshire area. On November 30th, 2002 we placed our first nurse at a facility in Manchester, New Hampshire. Today in 2018, we have expanded into five states with hundreds of healthcare professionals and facilities! We still have the same passion for helping healthcare professionals find employment that fits perfectly with their needs. For the month of November, we will be celebrating by positing all things related to the number sixteen on our social media with the hashtag #NMS16. Because our nurses and facilities are the ones that have kept our business alive for sixteen years, we want to invite you to get in on the celebration! What were you doing sixteen years ago? What did you look like at sixteen? Comment your own picture on our Facebook post, send us an email, or even post your own photo under the hashtag #NMS16. Have some fun with this! Again, thank you for being a part of the Northeast Med Staff team, and having a part in our success! Now, let’s celebrate!